is a passerine bird of eastern Asia in the Old World babbler family, Timaliidae. The name "Hwamei" comes from the Chinese 画眉 (huà-méi) and means "painted eyebrow" referring to the distinctive marking around the bird's eyes. The species is a popular cagebird because of its attractive song. It is 21 to 25 cm long with broad, rounded wings and a fan-shaped tail. The plumage is mostly reddish-brown with dark steaks on the crown, back and throat. There is a white ring around the eye which extends backwards as a white stripe. The bill and feet are yellowish. Birds on Hainan Island (L. c. owstoni) are paler below and more olive-coloured above. 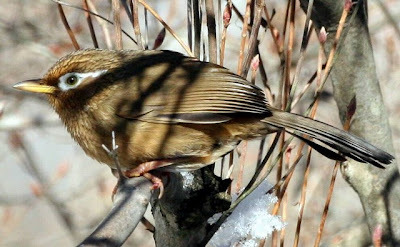 The Taiwan Hwamei is greyer and more streaked and lacks the white markings on the head. The song is a loud, clear, varied whistling with regular repetition and imitations of other birds. The call is a rasping whistle or rattle. It is a skulking bird which is often very difficult to see. It typically feeds on the ground among leaf litter, foraging for insects and fruit. It usually occurs in pairs or in small groups. The breeding season lasts from May to July. A large cup-shaped nest is built up to two metres above the ground in a tree or bush or amongst undergrowth. Two to five blue or blue-green eggs are laid. Let me tell you what Daruma was watching! There is a bird called DARUMA-Enaga. This is quite a large group, with many sub-species. 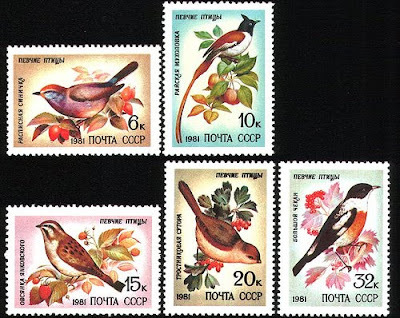 A Russian set with this bird as one of them. One more Daruma Bird !